Circa 1892. This gracious country manor was designed by English architect Ernest Coxhead, who patterned the home after designs prevalent during Shakespeare's time. 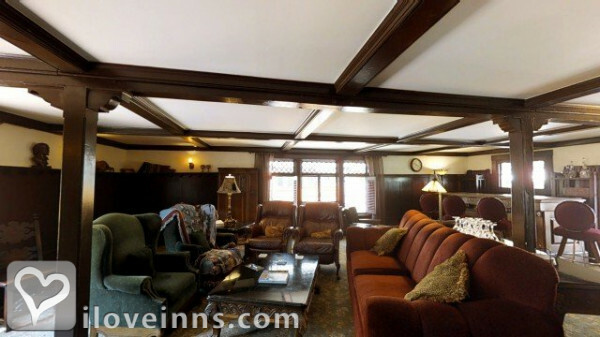 The innkeepers received an award of merit for their restoration efforts and it's clearly deserved. Guests ascend rolling redwood staircases to reach their posh rooms decorated in rich colors and filled with vintage antiques. Each room features its own color scheme and unique touches. The Churchill Chamber, the original master bedroom, is adorned in grays, tans and black and boasts ornate furnishings, a gas fireplace and a two-person whirlpool tub. A secret passage leads to the honeymoon suite, formerly the gentlemen's smoking quarters during the prohibition era. 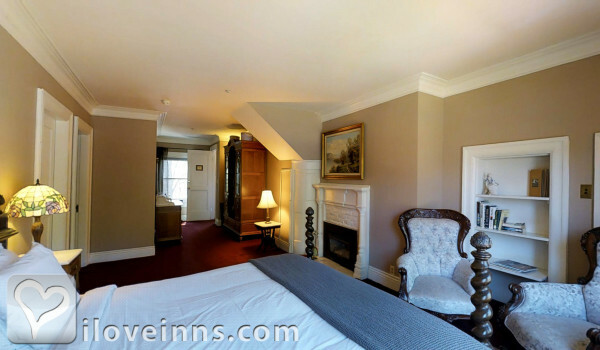 Four guest rooms include gas fireplaces, and others feature clawfoot, whirlpool or Jacuzzi tubs. A full gourmet breakfast is served either in the dining room or in the bright sun room, a perfect start to a full day exploring Napa Valley. An evening wine and cheese reception welcomes you back at the end of your day. Payment Types Accepted Include American Express, Master Card, Discover, Visa and US Dollars. This property has 9 total guest accommodations with private bath. Warm romantic welcoming rooms with Jacuzzi tubs, luxurious robes, comfortable beds, port and chocolates in the room, In-Room massages and innkeepers who want to make your stay perfect. 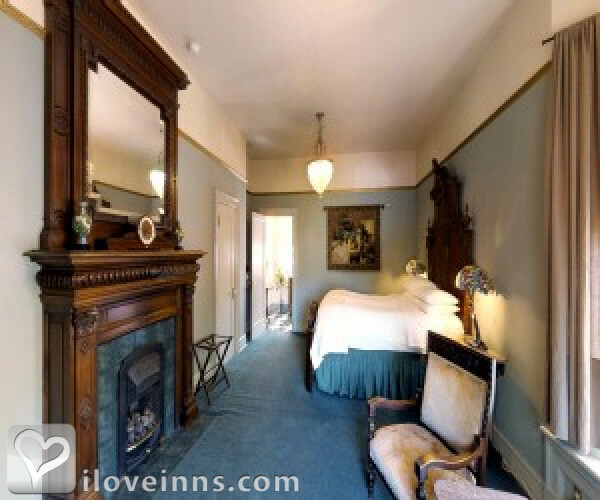 Named after Count Bonzi, an eccentric character who lived in the home in the 1920s, located on the mezzanine floor, this is the largest room in our Napa Valley inn. The ambiance invites you to sit in the small window bay accentuated with a colorfully stained glass window. 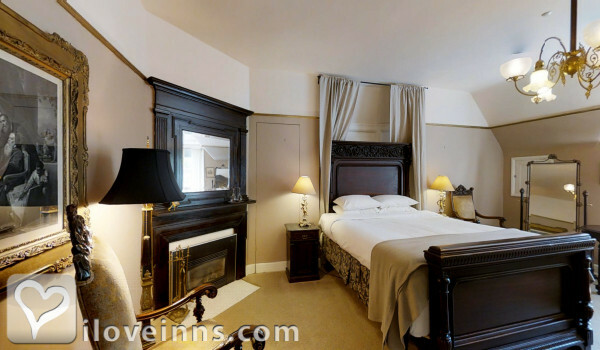 Enjoy a flickering fire in the gas fired coal burning fireplace as you relax in our queen size bed with an acanthus-style duvet cover and massive 8 ft. walnut headboard. The bathroom features a very private two-person side-by-side soaking tub with shower. It does not get any better than a getaway in Count Bonzi's room! A secret stairway used to lead to the "gentlemen's smoking room," now known as Lady Margaret's room. 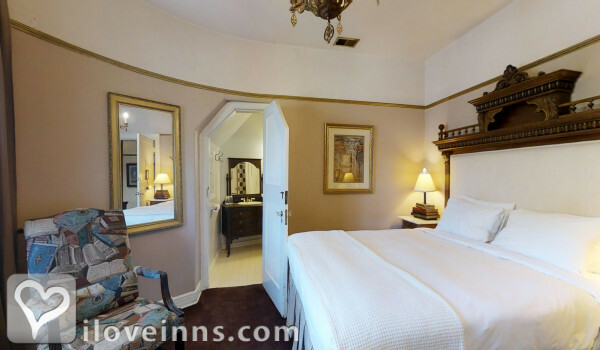 With its lush shades of zinfandel and taupe, The Lady Margaret, otherwise known as our Honeymoon Suite, offers you the most privacy and intimacy as it is located away from the other rooms on the mezzanine floor in our Napa bed and breakfast. It boasts a magnificent French oak armoire with mirrored doors, a marble-topped dressing table, and a King bed with beautifully carved wood and turned bedposts. A two person whirlpool tub, separate shower, as well as a gas burning fireplace make this room the perfect honeymoon getaway. This enchanting Junior Suite is one of our most unique lodging accommodations. Evocative blue and burgundy color schemes invite you into the sitting room where you'll find two plush wing-backed chairs and an antique Jacobean desk. Step down two stairs to find the bedroom on the left and the bathroom on the right. 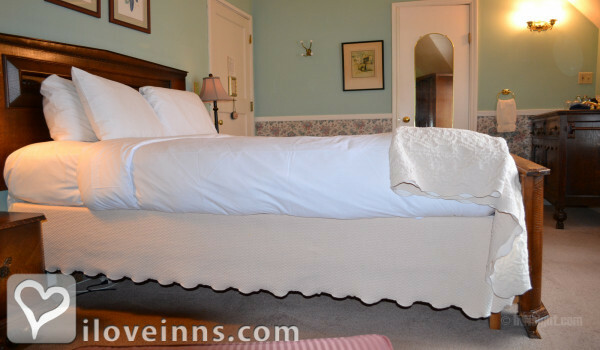 The cozy bedroom has a queen bed adorned with a beautiful bedspread and a white wrought iron headboard. The separate bathroom is equipped with a relaxing shower. Located in the turret, complete with curving walls, you can catch up on your reading in a room redolent with rich shades of plum and beige. Graced with a carved oak queen bed and two stately chairs, this room boasts an attractive library motif and features a darling collection of vintage antiques. 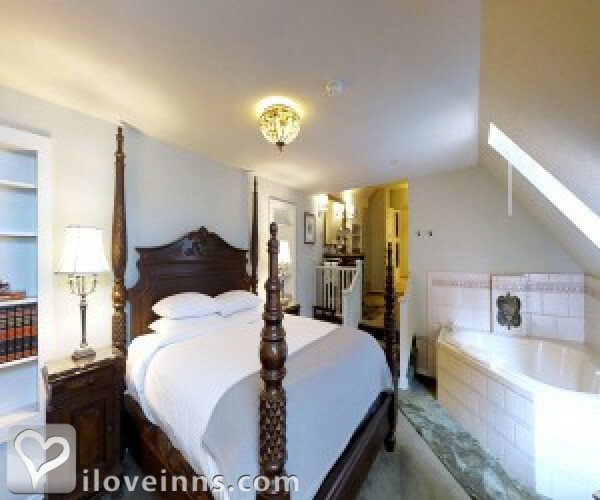 This impressive room also offers guests a private bathroom with a shower. History contributes largely to your experience at Cedar Gables Inn, and we make every effort to maintain the historic feel of our Napa Valley Inn without sacrificing present day amenities. Make your stay extra special with a weekend in Miss Dorothy' room. Named after Miss Dorothy Churchill, this romantic room, decorated in cheerful shades of rose and peppermint, has an elegant blend of oak and walnut furniture, including a queen bed with unique Italianate headboard and matching armoire. 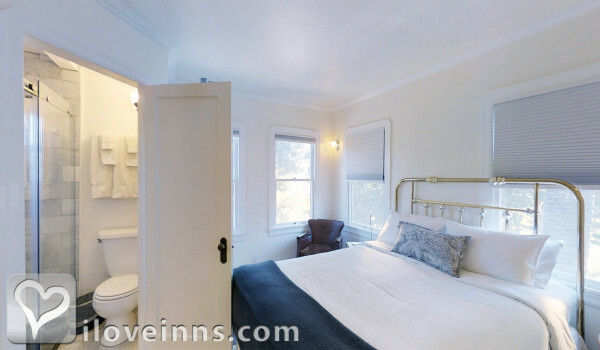 The oversized shower and old-fashioned fireplace mantle over the gas fireplace make for a very intimate setting in our Napa bed and breakfast inn. Our smallest room at approximately 180 sqft the newly remodeled Stratford Loft is perfect for guests who are looking for smaller accommodations. Decorated in shades of silver and chocolate, this petite room is as sweet as it sounds. A queen brass bed with stately coverlet invites you into a chamber resonating with all the adornments that would have satisfied a noble prince. This small, yet handsomely appointed room is approximately 180 square feet, with a private bathroom, and is located on the third floor. The Stratford loft will surely delight your senses not to mention your Napa lodging budget! Our smallest room at approximately 180 sqft The Avon Loft is suited for a princess. 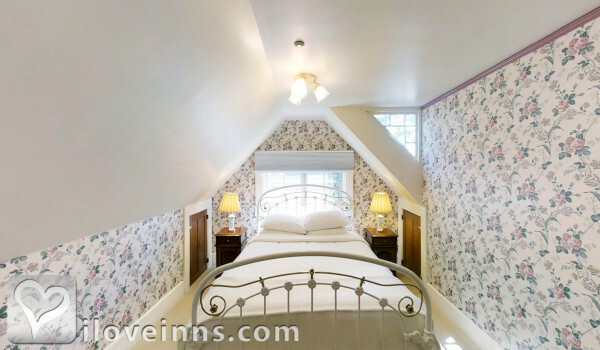 Quaint and charming, the Avon Loft is perfect for guests who prefer a smaller room. This bedroom rests on the third floor with a bright, cheery feel; it features a faux balcony with a grand view of the front garden. Let Romeo whisk you away with a midnight love song. 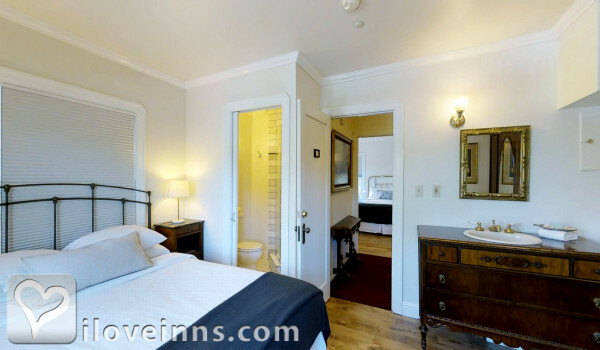 A comfortable queen bed and single person bathroom with walk-in shower complete this Napa lodging experience. Two-night minimum on weekend - Call 1 week ahead for exceptions. must be well behaved 13 year old or older. This is a romantic get away spot full of breakable antiques. Built in 1892 by the famous English architect Ernest Coxhead for Edward S. Churchill. In the 1930s Cedar Gables became a boarding house and during World War II it housed military nurses. We have stayed at this inn twice now and both times have been fantastic. The innkeepers, Ken & Susie Pope, take care of every need and are wonderful. The rooms are fabulous and close to excellent restaurants. If contemplating a trip to wine country, you need to do yourself a favor and stay at the Cedar Gables Inn. Ben & Susan Seabrook, Mount Pleasant, SC. This was the BEST B & B we have ever been too. It truely was the highlight of our trip up the coast in which we stayed at all B & B's along the way. Ken & Susie have created an experience filled with details that demonstrate how special they want you to feel while guest in their home. Cookies in the parlor upon arrival, evening wine, cheese and fruit, bathrobes to buble baths and special brandy in your room. The gourmet breakfast was outstanding and mde us feel like royality! I stayed at Cedar Gables in March 2010. Ken and Susie provide a great experience. They are close to downtown Napa. They make an oustanding breakfest and provide a great reception in the evening. Make sure to ask them about vineyards to visit. Also, ask Ken to sing. It was a real treat. This place is awesome if you are looking for a place that is a little ways off the beaten path but close enough to the Napa Valley wineries. The owners make you fill like you are a part of the family and cater to your every need, Need a reservation? No problem, they will take care of it for you. Complementary wine tasting evry evening as they explain the great wines from the local vineyards. Brunch of handmade goods and dishes is exceptional. Two-person jacuzzi tubes make for a romantic getaway. My wife and I just returned from Napa, CA, after celebrating her 30th birthday. 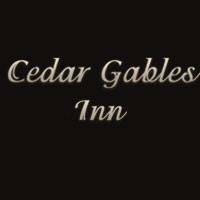 I found Cedar Gables Inn via Yahoo! Travel, and after reading many positive customer reviews, decided this was the place to book for my lodging. After having stayed there myself now, I must say that this B&B far exceeded my expectations (which were set high to begin with based on the reviews I had read). From the clean and exquisite rooms (all of which are unique in their own way), to the wonderful breakfasts, to the quiet evenings in the tavern with food, drink, and conversation, it's hard for me to imagine any place doing it any better than this. From the moment we walked in the front door, we were treated like we were long-time friends, and there's nothing that Ken and Susie (the innkeepers) won't do for their guests. It was the fact that we stayed here that made my wife's birthday as memorable as it was, and I won't need to waste any time considering what B&B to stay at when we return...the only question now is, which of the other unique rooms should we make a reservation for? Charming and elegant, yet strikingly cozy. This place tops the list in atmosphere and hospitality. California Visitor's Review, Fommers, San Francisco Chronicle, LA Times, Napa Register, tripadvisor.com, yahootravel.com, Travel Cafe, CBS Evening Magazine, Food Channel.